Sick day traditions — do you do anything special when your child is ill? I’m writing this post as I have Ava laying on the sofa with a mild sinus / ear infection. I just checked on her to make sure she’s comfortable, with her own pillow and the ‘sick sleeping bag’ — the sleeping bag that belonged to me when I was a little child. It has the manic orange colour combinations which are so typical for the ’70s, with cute circus illustrations, and is wild and fun enough to brighten up any sick day. I brought her tea and some fruit and nuts on a tray, and put my cool hand on her warm forehead to measure her temperature (I never use a thermometer!). It made me think of sick day traditions. When I was a child, I remember the food on a tray — I was always supposed to eat at the table, but when I was sick my mum would bring me tea, fresh orange juice and toast & fruit on a tray. To my bed or to the sofa, depending on how sick I was. And she would put her cool hand on my forehead to measure my temperature and read me my favourite story. : ) I still remember those soothing traditions, little things, but oh so important when you are feeling miserable! And I was wondering — what sort of traditions do other people have when their children are sick? Do you make chicken soup? Fruit mandalas? Do you have a special pillow or blanket perhaps? Do you remember being sick as a child? OK, time to check on my little girl. Happy (and healthy!) weekend everyone! PS Always in my handbag! My mother would put up a comfy camp bed at the end of my parent’s bedroom where we seldom intruded, with lovely cold sheets, and move us from our room there. Then with a huge show and step ladder, she’d reach down your ‘Sick Box’ from the top of the wardrobe. To open it up on the over bed table and examine the contents was one of the great excitements in life. My favourites would always be a wooden jigsaw with cut out shapes of all sorts of things, and of course a previously unread book. Love this even though I’m sorry Ava is sick! My parents would give me a “cool cloth” (a wet washcloth) for my forehead and make pastina with butter. Even today, a cool cloth helps me feel better! My mom always made, and still does- pastina with butter when we were sick!! And my grandmother used to make it for her! Loved thinking back to these moments. Even though I was sick, they are truly some of my fondest memories as a child! I think because I’m one of five, so the undivided attention alone felt so special. My mom would always make me a bed out of blankets on the floor, bring me chicken noodle soup and massage my feet. Such simple, sweet times. Love hearing all of the different traditions! When I was ill, my mum would allow me to go to my parents bed (which was a complete no-no otherwise), she’d bring me chicken soup (in bed!! Another no no), a drink and some fruit. I’d also get a new book or another small present. She’d also put a wet cloth on my forehead. I remember once they even brought the tv from the living room and rented a movie and let me watch it in bed (we never had tvs in bed or would be allowed much tv in general). It all felt like a bit treat although I felt poorly. I have great memories! My parents didn’t let us watch much TV and we didn’t have many videos. We did have a box set of Fawlty Towers and we were allowed to watch it when we were home sick. Such strange British humor, but I still remember every story!!! Bij ons was het vroeger: appelsap, beschuit met bruine suiker of lange vingers. En het dekbed van biven mocht op de bank. En overdag even tv kijken, maar dan wel het liefst schooltv haha. Grappig dat de warme herinneringen overblijven van deze momenten die in eerste instantie helemaal niet leuk waren. In ons eigen gezin gaat het ingeveer hetzelfde. Krukje naast de bank met alles voorhanden wat ze nodig kunnen hebben. Zo’n speciale deken klinkt eigenlijk ook wel fijn! Maar voor nu hoop ik vooral dat het voorlopig niet nodig is en Ava snel opknapt!! We always had a special blanket- a patchwork quilt that my mum made- and were allowed to lie on the sofa. 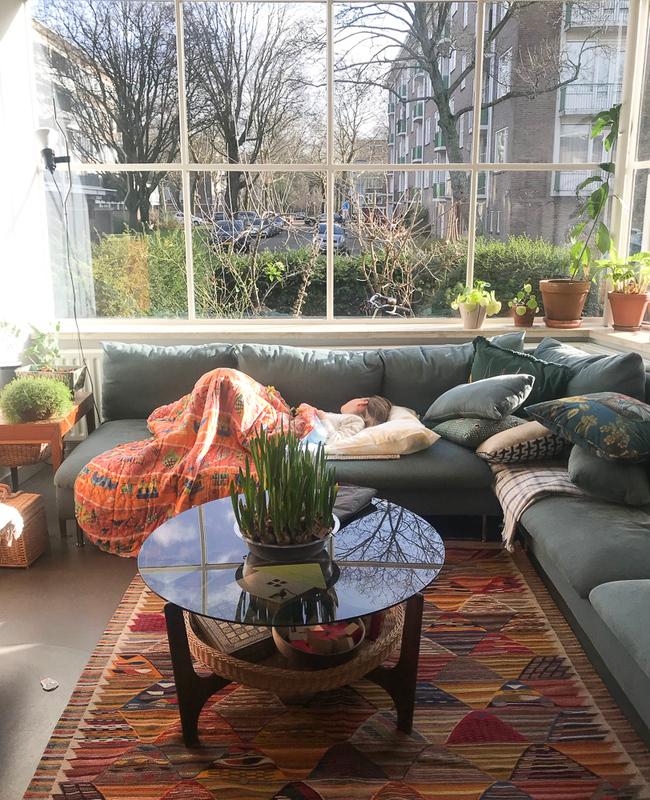 I was one of four and also loved the one-to-one attention and calmness that came with a sick day… the issue for me was that as a child I started to fake sickness (regularly and from quite a young age!) to be able to get this experience- so now I need to work out how to provide my children with nice memories and a routine without them trying it on too often!